절에 행사가 있을때, 절 입구에 당(幢)이라는 깃발을 달아두는데, 이 깃발을 달아두는 장대를 당간(幢竿)이라 하며, 당간을 양쪽에서 지탱해 주는 두 돌기둥을 당간지주라 한다. 온양시내에서 송악면 쪽으로 3㎞정도 떨어진 곳에 위치한 이 당간지주는 화강암으로 되어 있으며, 받침부분인 기단(基壇)이 땅 속에 묻혀 있어 마주 세워진 두 기둥만 드러나 있다. 기둥머리는 완만한 곡선을 이루고 안쪽에는 깃대를 단단히 고정시키기 위한 네모난 홈이 파여져 있다. 표면이 심하게 닳아 다른 조각이 있었는지는 확인할 수가 없으며, 기둥 바깥쪽 두 모서리를 깎아내어 마치 세로줄무늬를 새긴 것 같은 효과를 냈다. 위·아래 기둥의 굵기가 별 차이없이 다듬어져 전체적으로 세련미를 보이고 있다. 지주가 자리하고 있는 지금의 위치가 본래의 자리로 여겨지며, 정확한 연대는 알 수 없지만 전체적인 양식들로 보아 고려시대의 작품으로 추정된다. 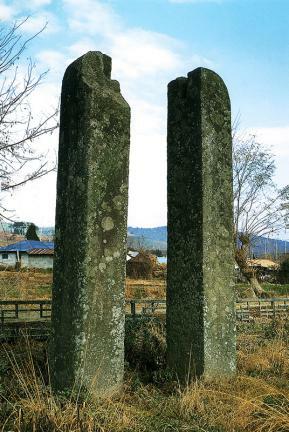 When a special event was held at Buddhist temples of yore, it was customary to hoist a flag that was known as the “dang.” The pole on which the banner was raised was called the “danggan,” and two stone pillars known as “dangganjiju” were used to hold this pole in position. 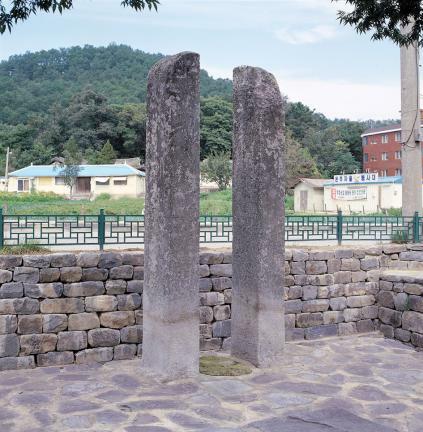 This pair of dangganjiju, made in granite, is situated some 3km outside the town center of Onyang, in the direction of Songak-myeon. 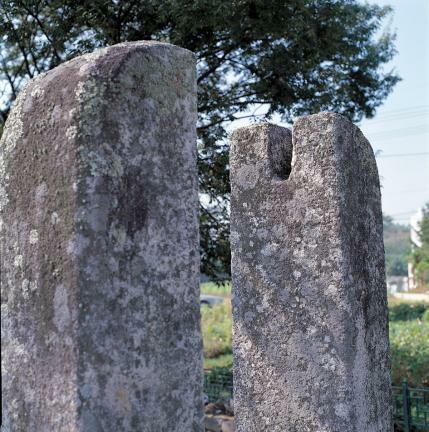 The stylobate of these two stone pillars that face each other are not visible, as they are buried in the ground. The head is slightly rounded, and the inner side has a vertical groove with a square cross-section, to hold the flagpole tightly in position. The surface is too heavily eroded to determine whether there used to be any carved designs or inscriptions. The two outer corners were cut, creating the impression of vertical line designs. The pillars were hewn in such a way that the upper and lower halves are even in thickness, giving them a refined overall appearance. 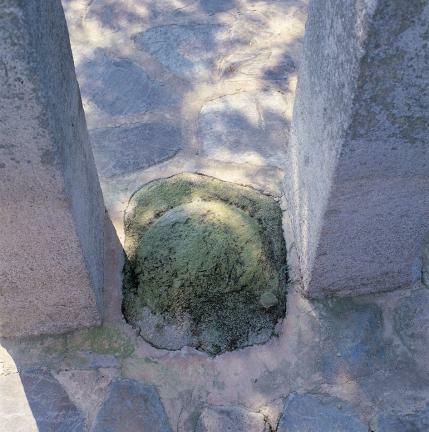 The current location of the pillars is believed to be their original one. 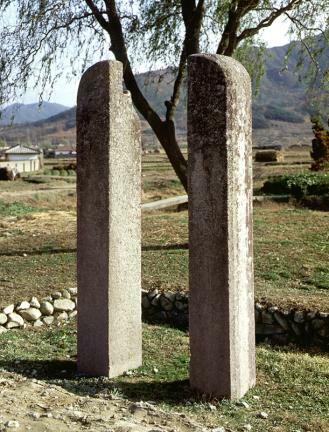 Although they cannot be dated precisely, this pair of dangganjiju is likely to have been made sometime during the Goryeo period.